The screen can be set to pause a film or go into standby when the passenger's eyes are closed, and restart automatically when they wake up. "The eye-tracking technology actually came from the handicapped market, and we've reapplied it to airlines," said Brett Bleacher, director of innovations for Thales. 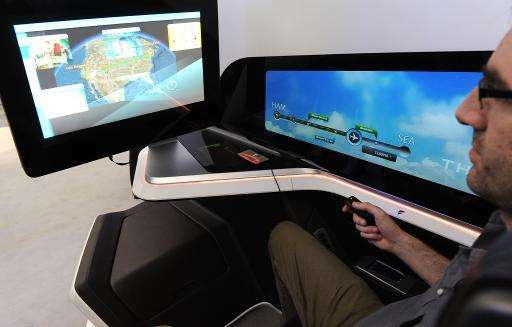 Bleacher said it was "still five to 10 years off" before the technology is actually installed in business class cabins. "We are just starting to build relationships with airliners to get this into production," he said. Marketing manager Mario Grima said the software would be introduced to airliners "very soon". "Airline screens have to go through a lot of certification and testing. They have to be much more rugged to make sure nothing goes wrong," said Grima. "If your iPad bursts into the flames on the ground it's not the end of the world, but if that happens on a plane, it's obviously much more of a problem." Companies including Panasonic and Thales also have to "future-proof" their computers to make sure that they can handle technology and software improvements. "You don't want to change the entire fleet's entertainment system every time some new software comes out, so we've had to make these much more powerful than an iPad," said Grima. The other important development has been to encourage more spending from customers—a factor that has become increasingly important for airlines as their profit margins are squeezed. "Ancillary revenue from selling tickets or teaming up with hotels and rental companies has become a huge and growing part of airline revenue," said Scott Easterling, director of in-flight entertainment for Thales. "Now that we have this really good permanent connection to the ground, we can do all sorts of things—we are only just scraping the surface," said Easterling. Will iPads revolutionize in-flight entertainment?